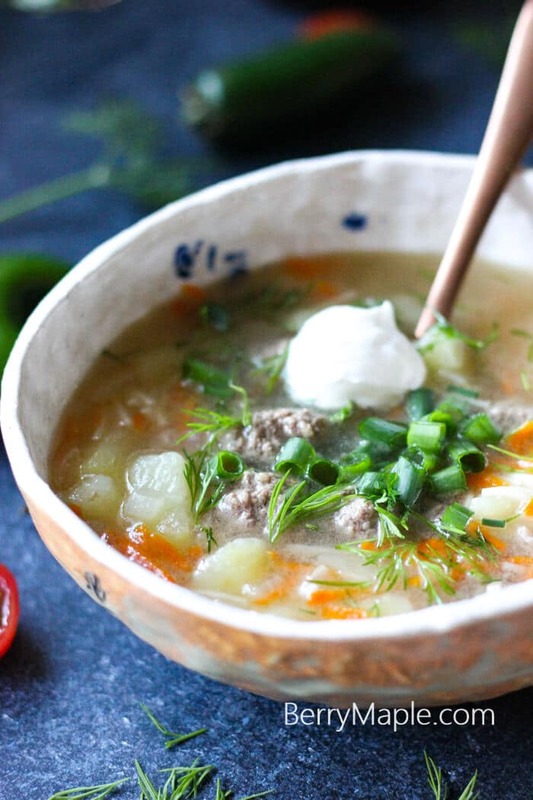 So easy and delicious mini meatball soup that you and your kids-even toddlers- will love! Our family favorite! Every soup in my house is cooked from scratch. I don’t remember buying store bought chicken or beef stock for my soup, like, ever. It is SO easy to buy your own chicken or beef, separate it in to different zip lock bags and freeze. Then it takes exactly 20 minutes to cook it to a broth. Done. 🙂 If i will ever have a farm- getting chickens will be highest priority! For soups i prefer to use only organic free range chickens(from local farmers) or grass fed beef. Its a bit pricey, so i use it only for soups. 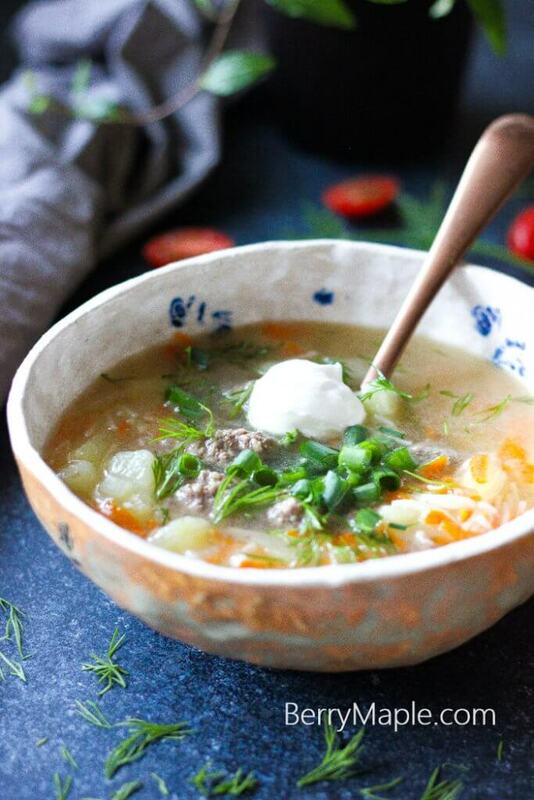 For this soup i used ground beef, but you can easily substitute it for ground chicken or turkey. 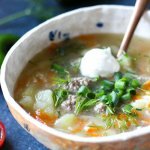 This mini meatball soup was made for my kids, they love to have it for lunch and finish the leftovers next day. Sometimes i even put a corn in there(cut in three pieces), but today i didn’t have any on hand. You can add some, its delicious. Shred the carrot and chop the onion. Add them to a medium pot , add olive oil and cook for 5 minutes over medium high heat until fragrant. Peel potatoes ans chop in to small cubes. Form little meatball from the ground beef. Add water to the pot. Add chopped potatoes, meatballs and bay leaves. Cook over medium high heat for 15 minutes. Add noodles and cook for additional 5 minutes. Salt and pepper to taste. I love your tip to cut and freeze portions of meat for soups. I’d never thought of it! And my kids love mini meatballs, so I’ll definitely try this recipe. Thanks! Meatballs are such fun things to work with. 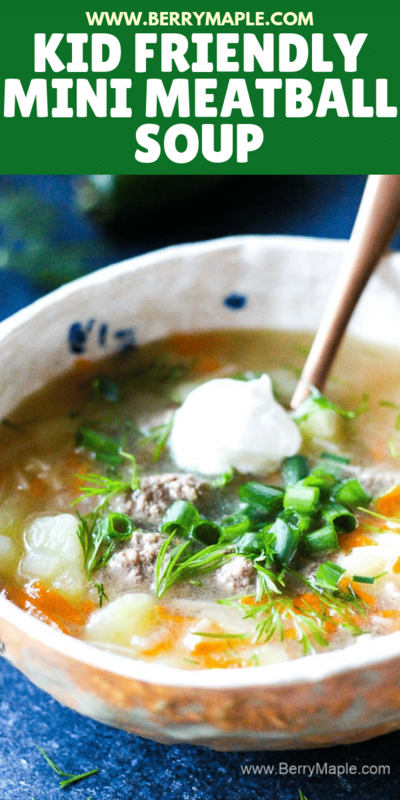 Stuffed in buns, on pasta….and like here, in delicious soup. They are economical….and you can never go wrong with any flavour they come in. This is so similar to a filipino dish my mom used to make us all the time. She didn’t put any veggies in it so my brother and I loved it. Thanks for bringing back memories! !